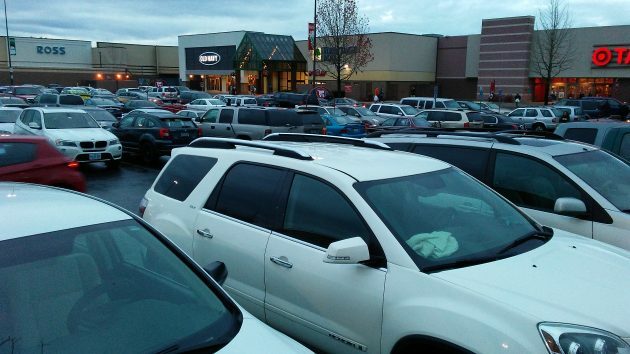 Parking spaces at Heritage Mall were filled as far as the eye could see on Friday afternoon. There’s a movement across the country to show that towns have been requiring far more off-street parking than they need. But on Friday afternoon at Heritage Mall, it would have been hard to find anyone who agreed. When I stopped there around 3:30 or so, the parking lot was pretty much jammed full. And when I ventured inside the mall itself, there were plenty of people, though I couldn’t tell if they were buying a bunch of stuff or, like me, just looking around. Not long ago I became aware of StrongTowns, which describes itself as a movement to build strong cities and neighborhoods. On its website, strongtowns.org, one of its arguments is that city regulations generally require way too much off-street parking. It contends that most of this is wasted because it isn’t used much and doesn’t generate tax revenue to support the community. On the occasion of Black Friday, the outfit urged readers around the country to go out and photograph near-empty parking lots to prove its point. And sure enough, by the end of the day the website showed lots of empty parking spaces in malls, big-box stores and even some downtowns. As for me, I stopped by Heritage Mall to take a look. But to get out and take a photo, I first had to find a place to park. (I know: I should have taken the bike, but it was spitting rain and threatening to get dark.) Finding an empty spot took some driving around the lot. It was not impossible, obviously, since I found one after a few minutes. But the experience suggests that the parking requirements for Heritage Mall, which was built in the 1980s, are still just about right. On weekday mornings during much of the year, a good part of this relatively small mall’s parking area may go unused. But on the days when merchants in the place go all out to attract enough business to make their year, the supply of parking spaces seems to be in balance with the demand. StrongTowns makes interesting points about municipal finances, the main one being that residential development in big, spread-out subdivisions doesn’t pay its way for maintenance and replacement of infrastructure. We’re seeing something like that in Albany, where the council is called on to raise water and sewer rates nearly every year in a brave attempt to catch up with capital construction needs, and where hundreds of millions of dollars in street repairs are not getting done because the money is not there.